This giant puffball adventure was penned by David Landers, a student in PLPA 319. Giant puffball mushrooms are said to be some of the most tasty and fun to cook mushrooms found in the woods. In the Northeast, they commonly grow in the early fall (August — September) on the edge of forests, in open woods, grassy fields, parks and meadows. It is not unusual to find them growing in fairy rings or as single specimens. A mushroom can easily be identified as a giant puffball by its giant size, shallow craters, misshapen spherical shape, lack of a stipe (stem), bright smooth white skin with irregular cracks at maturity. But caution must be taken because it can easily be mistaken for volleyballs or soccer balls that have been left in fields or lost in the woods. The largest ever recorded giant puffball was eight feet, eight inches in diameter and weighed forty-eight pounds4. While mine wasn’t that big it was still huge–as you can see from the picture. 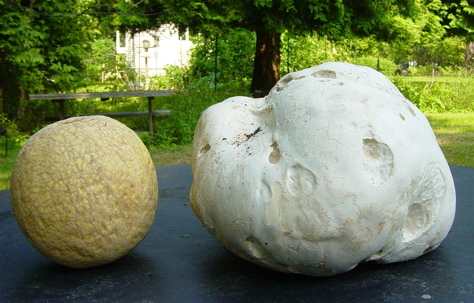 It was calculated that a single ten-inch giant puffball has as many as 7 trillion (7,000,000,000,000) spores. If each of those spores grew and yielded a ten-inch puffball, the combined puffball mass would be 800 times that of the earth. The flesh of a puffball is called the gleba, and when immature (and edible) it is pure white and has the texture of marshmallow. Once mature the gleba’s color changes to yellow and brown and it should not be eaten at this stage because of its poor taste and possible toxicity. In addition to a change in color the gleba becomes powdery at maturity due to the spores and capillitium (sterile threads that hold the spores). Some simple rules must be followed before eating giant or any puffballs. Cut all puffballs in half in order to be certain that there is no sign of gills. If gills are present it is not a puffball but instead the “button stage” of a gilled mushroom. The interior tissue must be uniformly white. If it is yellowish or brown this means it is approaching maturity and might have an off-flavor or possibly be toxic. If the mushroom is infested with insects/maggots it should be severely trimmed in order to avoid the infested parts. The outside skin is easily peeled and should not be eaten if it is tough, leathery, or dirty. Never wash the puffball with water as it will soak up water like a sponge and become very soggy. The puffball can be stored for 2-5 days in the refrigerator without losing significant quality. I turned to a book on my shelf I had never used before to figure out what to do with this monster of a mushroom. A Cook on the Wild Side: The Indispensable guide to Collecting and Cooking Wild Food by Hugh Fearnley-Whittingstall is a great resource for recipes and “how to” for foraged and wild ingredients. It covers everything from mushrooms and nuts to fish and game. Chop the pancetta into thick matchsticks, and fry in a little olive oil until crispy. Toss in the chopped garlic and fry until it starts to take color. Remove the garlicky pancetta from the pan and reserve. Bring 4 whole eggs to a boil in a small pan of cold water and boil them for just 4 minutes. Dip the puffball slices in the beaten egg, which has been seasoned, and coat well in the breadcrumbs. Fry in the same oil left from the frying pancetta, turning once until crispy and golden brown. Drain each puffball slice quickly on a paper towel and place on warmed plates. Peel the soft-boiled eggs carefully and cut them in half. Place 2 halves, yolk upwards, on each fritter and season with salt and black pepper. Sprinkle over the garlicky pancetta. Fearnley-Whittingstall, Hugh. A Cook on the Wild Side: The Indispensable guide to Collecting and Cooking Wild Food. Macmillan Publishers Ltd, London. 1997. Lincoff, Gary. National Audubon Society Field Guide to North American Mushrooms. Alfred A. Knopf, Inc. New York. 2004. McKenny, Margaret and Daniel Stuntz. The New Savory Wild Mushroom. University of Washington Press. Seattle, Washington. 1991. Puffball. http://www.innvista.com/HEALTH/foods/mushrooms/puffball.htm. Found on October 23, 2006. Smith, Alexander H. The Mushroom Hunter’s Field Guide, Revised and Enlarged. The University of Michigan Press. Ann Arbor, Michigan. 1969. Let us know how it tastes! Personally, I’m not a giant puffball aficionado, but some people just love them. Amazing images! I do wonder if they can easily be grown on a small lawn. Thanks for sharing! My neighbor was asking what all those large, white balls were doing in my side yard, under the shrubs. I had no idea, but had seen them several times before. Never this quantity or size, maybe they are supersized due to all the rain we had this year?? Whatever the case, I did not realize they are edible, or the 7 or 8 that I tossed out would have been experimented with in the kitchen. I was concerned about letting them rot in place, and setting the stage for an even larger crop next year. Does anyone know if this can that happen? I had a large, ailing maple cut down in the same vicinity six or seven years ago…and am assuming old roots may be the food source? but Yummy. Passed the rest out to co-workers, there was enough for a small army! David, Giant Puffballs are an amazing wild ingredient and this Puffball Fritters recipe sounds delicious…thanks! Ok so i am doing a project on them in school and i was wondering if the puffball eats anything itself because that is on the project. But they sound really cool! Hi Katie, you can find more info about what puffballs eat on this more recent post.